A reader, Helen, has this plant growing in her garden, as do I. It is a shrub about 3 m tall and has large Tibouchina-like leaves. In autumn it has panicles of smallish white flowers. I thought it was Tibouchina clavata but someone else suggested it is a Miconia. I wonder if anyone knows the correct name and whether or not it is a weedy species that might self-seed as some Miconia species apparently do? if you search miconia on google it certainly looks like that and some species are causing problems in Hawaii and Tahiti - invasive on a massive scale!!! Hello, my name is Meg. I"m a new member and wishing to identify this small flowering new tree found on our property on the far nth coast. It has attained about 3 metres and may be just starting to flower. 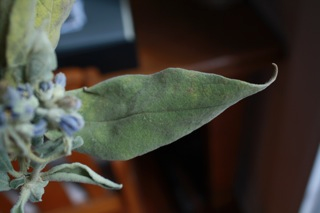 The leaves are long and velvety, with panicles/clusters of small lavender-blue flowers and it is also sporting clusters of lime green berries. It intruded unnoticed but has flourished close to the road boundary during the past two years of mainly wet conditions. The plant looks like a "tobacco plant". I don"t know its formal name, it is a highly invasive plant, the leaves have an awful aroma and seedlings will appear for years. One pleasant aspect of the one that grew in neighbour"s garden was the beautiful parrots that came to eat the berries, then they would have helped spread the seeds further afield. 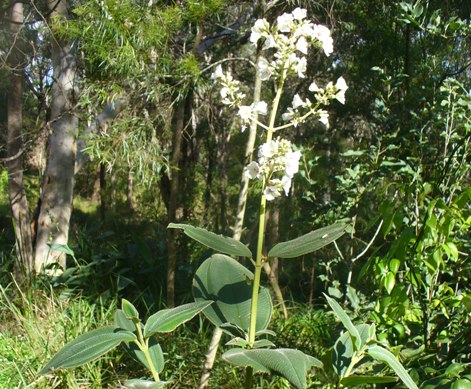 Unfortunately, it can be seen throughout the bushy roadside areas around Sydney. Get rid of it! I thought tobacco weed was a declared plant. It"s a menace but no one seems to be interested in getting rid of it. It is so invasive; a shocker.